The 4-130-0128 can be mounted in tight-ﬁt locations to assure that only actual engine vibrations are transmitted for analysis. CEC Vibration Products is proud to present the newest addition to the very successful 4-130 family of self- generating, low impedance, velocity output vibration transducers. 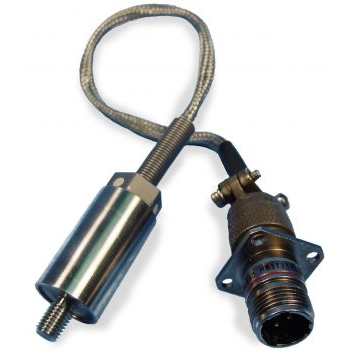 Designed for use on turbine applications where temperature and noise can cause other sensors to malfunction, the 4-130-0128 can be mounted in tight-ﬁt locations to assure that only actual engine vibrations are transmitted for analysis. CEC velocity transducers simplify your analysis system because low impedance, high level AC mV output does not require special preamplifiers or costly low-noise cables. The 4-130-0128 velocity transducer provides a direct calibrated AC mV/inch/sec output that can be transmitted via standard cable uninterrupted to the monitoring systems.